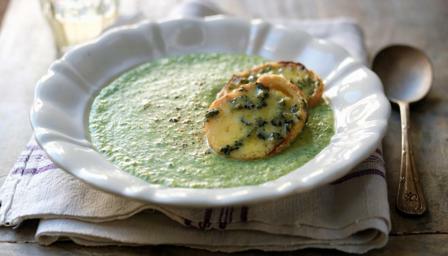 Our easy creamy broccoli and Stilton soup recipe with bubbling Stilton croûtons is the perfect antidote to the winter blues. Cover the bowl with cling film and place in the microwave. Cook on full power for four minutes, or until tender. Transfer the cooked broccoli and stock to a food processor. Add the fried spring onions, Stilton and cream and blend until smooth. Transfer the blended mixture to a pan and bring gently to a simmer. Meanwhile, for the croûtons, toast the French bread under a grill until golden-brown on each side. Top the grilled bread with the slices of Stilton and return to the grill until golden-brown and bubbling. Divide the soup equally among four warm bowls and top each with a Stilton croûton. Serve.